Cy Avery was a Tulsa-based oilman and real-estate investor. He also was a visionary. Before he cobbled together plans for a national highway that would stretch almost 2,500 miles from Chicago to Los Angeles, traveling through most states was a challenge, since few roads were even paved. 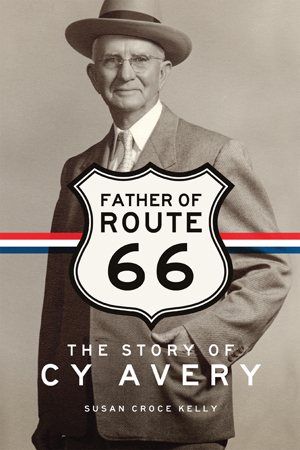 The story of Avery and Route 66, the legendary “Mother Road” he helped to build, is fascinating … fascinating because it almost didn’t happen. Avery, who had immigrated to Oklahoma as a teenager in a covered wagon, discovered at an early age that travelers often were confronted by “the mighty monarch mud.” As soon as he became an adult, he began his fight for better roads, not just in Oklahoma, but throughout the country. Avery became so obsessed that several wealthy Tulsans talking one day set out to see who could tell the biggest lie. The winner was a man who said he heard Cy Avery speak to a crowd without mentioning roads. Getting approval and funds to build the national highway was not easy. For example, he met with opposition by members of Oklahoma’s Klu Klux Klan and had a dustup with the then-governor of Kentucky over the numbering of the highway. Even the route proved controversial when states and towns bypassed by the road began to protest. Route 66 was finally established in 1926, and paving began that same year. By the Depression era it had become a way West. Avery’s Route 66 would become a fixture in the imagination of not just America but of the world, and it would help bring about another iconic road — the Interstate Highway System of the 1950s.